For both positive and negative results, the power of suggestion is a powerful thing. A roommate who habitually orders pizza for dinner means you’re probably more likely to end up eating pizza at midnight instead of carrots and hummus, but that formula goes both ways (to the benefit of your roommate’s health). Likewise, if you live with a roommate or significant other who exercises frequently or is training for a marathon, you’ll naturally be thinking about exercising more than you would be without them around. It’s all about surrounding ourselves with positive influences. But when you are the positive influence, there’s a potential downside (you eat the pizza). You want to encourage and motivate your friends and loved ones, but not by sacrificing your own goals. It’s great to take your wife out running, but if you’re trying to maintain seven minute miles and she’s meandering along at eleven minutes per mile, you risk falling behind in your regimen. If you’re not working toward a personal goal or training for an event, it’s easy to slack off when a workout partner has less endurance. But just because they’re calling it a day after 20 minutes of running doesn’t mean you should too. The best way to stay on track is to have a plan. Even if you’re not preparing for a race or an endurance event, it’s worthwhile to set a 12-week goal and follow a planned regimen to accomplish it. Your partner should do the same, but obviously with a more appropriate plan for their skill, strength, and endurance level! Once you’ve set individual goals that you can both work toward, it’s time to figure out how those can interweave and work together. Even if you’re working toward a marathon and your partner is simply trying to run their first 5K, there are plenty of ways you can overlap and still train together. Even at an experienced level, a novice workout partner can still provide the extra motivation you need to push yourself further. 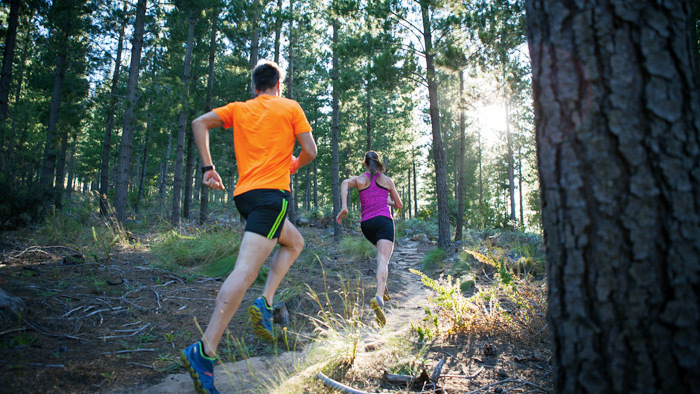 Let’s say your training plan calls for a five mile run one day. You know your pace, so you could start slower and run your fastest mile at the end. Begin your run together and arrange to meet at the end and compare notes. Or, run a circuit where you can see each other throughout the workout, like laps on a track. There may be days when your workout plan calls for a ten-mile endurance run, and your partner simply can’t join. But because they have a goal and regimen of their own, they’ll stay on course rather than just being discouraged and taking the day off. For many athletes, certain foods can be a weak point. If you’ve just run for two hours while training for a marathon, you might stagger into the house famished for the first and easiest thing to eat. An entire bag of tortilla chips later, you wonder how much of your effort you’ve just negated. Having an exercise partner goes beyond exertion. By planning healthy meals together in advance, it’s easier to stay on track and eat the food your body needs to thrive. My wife and I are a perfect case-in-point: I’m the one who gets her out the door to run, and she makes sure I have a green drink or a smoothie rather than demolishing a jar of salsa every time I get hunger pangs. Knowledge is power, and nowhere is that more true than when improving your health. In the 4-Hour Body, author Timothy Ferriss emphasizes the importance of establishing baselines before beginning a workout program. By knowing your Functional Threshold Power, your heart rate, your pace average, and your Body Mass Index, all actual numbers, we can track your progress and results, even with the natural ebb and flow (and inevitable, occasional discouragement) that comes as we improve our health. When I began running, I found myself quitting or walking soon after I got tired. But after purchasing a Garmin Forerunner watch, at a glance I knew that I’d only gone half my total distance from a few days before. That information helped me process the understanding of, “I shouldn’t be as tired as I feel right now,” and press on, pushing myself further and further. Today, I utilize apps on my phone that track my distance and my pace and notify me at intervals as I run. On the rare occasion that I workout without this extra information, I found myself feeling the urge to stop or give up far sooner. Thus, tracking your progress, both in real time and over days and weeks, is a prime motivator for both novices and experienced athletes. It’s much easier to reach our goals when we can chart noticeable progress over time, especially when rebounding from a discouraging day. If you and your partner are both training for a run of different lengths, perhaps your fourth day each week may call for cycling or swimming. Even if you’re a far more experienced runner, you may find that your novice partner is quite the expert in a swimming pool! It’s in cross training that we often find the activities that we can share with a partner and thrive together at. Cross training can also include yoga or a group workout class, or be as simple as stretching, warming up and cooling down together before and after individual exercise. I’ve been on both sides of the experienced/novice equation. When I first took up regular running in my late 20s, I tried to jog with friends who had run their whole lives, only to find myself panting and walking just as they were getting warmed up. Likewise, in more recent years, I’ve encouraged my wife to join me on runs, finding ways to maintain my own training and momentum while encouraging her and enjoying exercise together. The key is to establish personal goals, and then discover how you can help each other to achieve them.